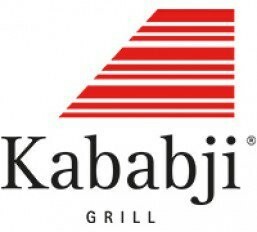 Kababji Grill is currently closed for delivery and it will open at 10:00 AM today . Rocca, lettuce, purslane, tomatoes, cucumbers, freshly squeezed lemon juice, virgin olive oil, hint of garlic & pomegranate syrup. Fresh parsley, tomatoes, cracked wheat, onions, freshly squeezed lemon juice & virgin olive oil. Rocca, bakli, freshly squeezed lemon juice & virgin olive oil. Fresh parsley, tomatoes, quinoa, diced onions, freshly squeezed lemon juice & virgin olive oil. Medley of mixed greens, tomatoes, cucumbers, freshly squeezed lemon juice & virgin olive oil. Oriental Chicken Salad ???? ????? ?????? Medley of mixed greens, tomatoes, cucumbers, freshly squeezed lemon juice & virgin olive oil with skinless boneless chicken breast cubes marinated in a special blend of spices. Topped with virgin olive oil & fresh mint. Blended chickpeas, tahini & freshly squeezed lemon juice topped with virgin olive oil. Blend of chickpeas, tahini, fresh lemon juice with sautéed minced meat. Blend of chickpeas, tahini, fresh lemon juice with pine nuts. Blend of chickpeas, tahini, fresh lemon juice with sautéed minced meat & pine nuts. Fresh eggplant grilled over charcoal, lightly mashed with tahini & freshly squeezed lemon juice topped with virgin olive oil. Mix of bread crumbs, hot pepper paste & spices, topped with walnuts. Hand-rolled stuffed grape leaves flavored with pomegranate syrup. Whole chickpeas mixed with yoghurt & topped with roasted pine nuts. Whole chickpeas mixed with yoghurt, grilled eggplant & topped with roasted pine nuts. Whole chickpeas mixed with yoghurt, grilled eggplant, topped with roasted pine nuts & kabab. Whole chickpeas seasoned with spices, garlic & topped with virgin olive oil. Whole chickpeas seasoned with spices, garlic, virgin olive oil & topped with roasted pine nuts. Whole fava beans seasoned with spices, fresh lemon juice, tomatoes, onions, parsley & virgin olive oil. House-made bread stuffed with ground meat, herbs, tomato, hot pepper paste, pine nuts & house-blend dressing. House-made beef sausages made with pine nuts & pomegranate syrup with a special blend of spices. Fried potato cubes mixed with herbs, coriander, spices & virgin olive oil. French fries blended with special spices. Diced potatoes grilled over charcoal. Cracked wheat mixed with meat, stuffed with sautéed ground meat, onions, pomegranate, walnuts & a blend of spices. A special mix of cheese, herbs & spices, rolled in house-made dough. Pocket house-made dough stuffed with flavorful seasoned meat mixed with pine nuts & house-blend spices. 3 Pcs, Cracked wheat stuffed with hommos. Pocket house-made dough stuffed with mutabbal eggplant. Halloumi cheese topped with a mix of bread crumbs and almond. Skinless boneless chicken breast cubes marinated in a special blend of spices. Grilled Veal tenderloin cubes & grilled onions marinated in a special blend of spices. Ground meat kneaded with house-blend spices & parsley. Ground meat kneaded with house-blend spices, green chili, parsley & hot pepper paste. Ground meat served with grilled onions, tomatoes, eggplant & chili pepper. Ground meat kneaded with house-blend spices & parsley, served over a bed of mashed tomatoes. Ground meat served with eggplant cubes. House-made beef sausages made with pine nuts & a special blend of spices. 1 skewer of shish taouk, 1 skewer of grilled Veal filet and 2 skewers of kabab halabi. Marinated grilled veal tenderloin cubes with grilled onions. Ground lean meat, kneaded with house-blend spices, onions & chopped parsley. Ground lean meat, kneaded with house-blend spices, onions, chopped parsley, green chilli & hot pepper paste. Ground meat kneaded with house-blend spices, cracked wheat & roasted pine nuts. 2 skewers of skinless boneless chicken breast cubes marinated in a special blend of spices. 2 skewers of grilled baby Veal tenderloin cubes marinated with a special blend of spices. 4 skewers of ground meat kneaded with house-blend spices & parsley. 4 skewers of ground lean meat, kneaded with house-blend spices, onions & chopped parsley. 4 skewers of ground lean meat, kneaded with house-blend spices, onions, chopped parsley, gree chilli & hot pepper paste. 4 skewers of ground meat kneaded with house-blend spices, green chili, parsley & hot pepper paste. 2 skewers of ground meat kneaded with grilled onions, tomatoes, eggplant & chili pepper. 4 skewers of ground meat kneaded with house-blend spices & parsley served over a bed of mashed tomatoes. Half chicken marinated in a special kababji blend of herbs & seasonings, served with seasoned fries. Lean lamb chops with a special house marinade. Grilled Veal filet, taouk, kabab eggplant, kabab halabi & makanek extra.